1 pair of Old UK No. 12 / US 2 / Metric 2.75mm knitting needles. No gauge was given in the original pattern. Cast on 44 sts. and work in K2, P 2 rib for 2 ins. Work 2 rows in st st, inc. in every 20th st. on the 1st row (46 sts). Now commence fair isle and thumb gusset. Work from the accompanying chart for the first 25 sts. on needles. Each square represents 1 st., and there are 25 sts. and 34 rows to the complete patt. 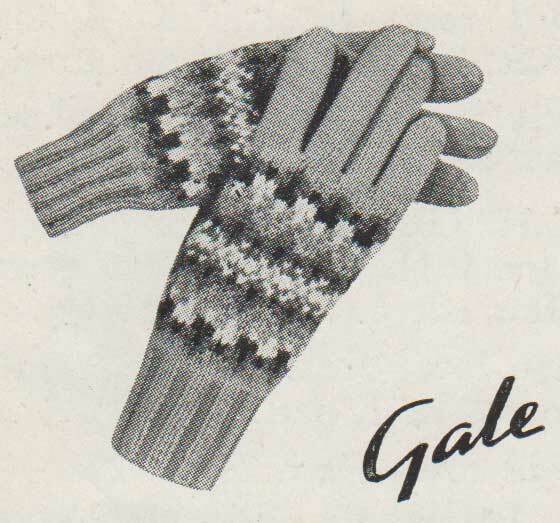 As the entire chart for the Fair Isle is given and the gloves are worked in st st throughout, these sts. will not be explained in detail, but will be referred to as “patt. 25”. The palms and fingers are worked in st st in red. 1st row (R.S.F. ): Patt. 25, inc. into the next st., K to end. 2nd row: P. 22, patt. 25 . 3rd row: Patt. 25, inc. into each of the next 2 sts., K to end. 4th row: P. 24, patt. 25. 5th row: Patt. 25, K24. 7th row: Patt. 25, inc. in the next st., K2, inc. in the next st., K to end. Cont. in this way, inc. 1 st. at each side of the thumb gusset in every 4th row, i.e., 11th, 15th rows, and so on. Rep. the last 4 rows 4 more times, allowing for 2 extra sts. in thumb gusset after each inc. There will now be 13 extra sts. on needles. Patt. 25, K15 in red, turn, P15 back, turn, and cast on 3 sts. Work in st st on these 18 sts. for 1½ ins. (or length required). 1st row: * K1, SSK, K3, K2tog, K1 , rep. from *. 3rd row: * K1, SSK, K1, K2tog, K1, rep from *. Break off wool, thread through remaining sts., and sew down seam of thumb. Next row: Using red wool, pick up 3 sts. from the base of thumb and K to end. Cont. across all sts. until the fair isle chart has been completed. K2 rows in st st in red. (R.S.F. ): K30 sts., turn, P13 back, turn, and cast on 3 sts. Cont. in st st on these 16 sts. for 2 ins. (or length required). 1st row (R.S.F. ): * K1, SSK, K2, K2tog, K1. rep. from *. 3rd row: * K1, SSK, K2tog, K1, rep. from* . Finish off as for thumb. (R.S.F. ): Rejoin wool and pick up 3 sts. from the base of the First Finger, K6, turn, and P15 sts. back, turn, and cast on 3 sts. Cont. in st st on these 18 sts. for 2¼ ins. (or length required). Shape top and finish off as for thumb. (R.S.F. ): Rejoin wool and pick up 3 sts. from the base of the Second Finger, K5, turn, and P13 back, turn, and cast on 3 sts. Cont. in st st on these 16 sts. for 2 ins. (or length required), and finish off as for First Finger. (R.S.F. ): Rejoin wool and pick up 3 sts. from the base of the Third Finger, K to end. Cont. in st st on these 15 sts. for 1¾ ins. (or length required). 1st row: K1, * SSK, K2, K2tog , K1, rep. from *. 3rd row: K1, * SSK, K2tog, K1, rep. from *. Finish off as for thumb and sew down seam of glove. Work exactly as for R.H. until commencement of fair-isle and thumb gusset. 1st row: K19, inc. into the next st., K1, patt. 25. 2nd row: Patt. 25, P22. 3rd row: K19, inc. into each of the next 2 sts., K1, patt. 25. Cont. in this way, inc. 2 sts. in the thumb gusset in every following 4th row until there are 13 extra sts. on needles. (R.S.F. ): K34, turn, cast on 3 sts. and P18 back. Work on these 18 sts. as for R.H. thumb. (R.S.F. ): K30, turn, and cast on 3 sts., P16 back. Work and finish on these 16 sts. as for First Finger R.H. (R.S.F. ): Pick up 3 sts. from the base of the First Finger, K6, turn, and cast on 3 sts., P18 back. Cont. in st st on these 18 sts. as for Second Finger R.H.
(R.S.F. ): Pick up 3 sts. from the base of the Second Finger, K5 sts., turn, and cast on 3 sts. P16 sts. back. Work and finish off on these 16 sts. as for Third Finger R.H. (R.S.F. ): Pick up 3 sts. from the base of the Third Finger, K to end. Work and finish off as for Fourth Finger R.H. 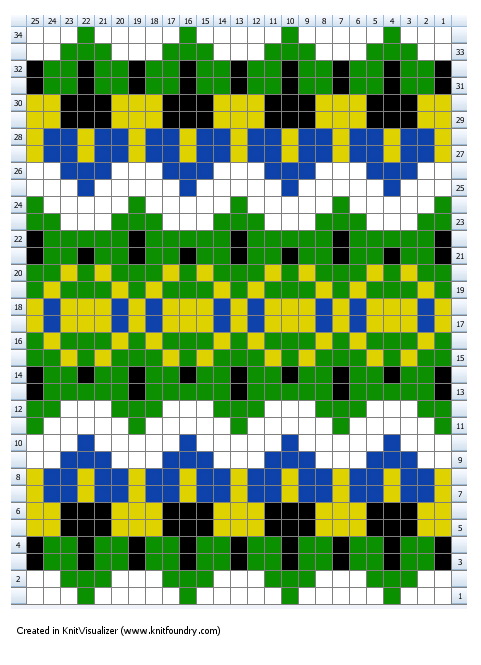 The original publication of this pattern is in the public domain, however, the text of this updated version and all charts are Copyright Sarah Bradberry, May 25th 2013. All rights reserved.